Motomachi is the premier shopping district of Yokohama. It consists of the lovely main arcade with boutique shops running some five blocks, and a parallel backstreet with many eateries. Looking for gifts and souvenirs? This is probably the place to go. Interestingly, the area has become something of a little wine country, with a startling number of boutique wine bars and restaurants—we like Tomei’s, in part because it is international, but also because they serve bottled California beers! Venture down to Ishikawacho’s funky backstreets as well. 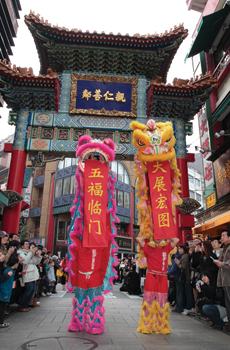 Chinatown is so vibrant and exciting that Chinese tourists even visit it when in Yokohama! The sheer number of restaurants makes this an essential destination for any foodie. But just the sights and sounds of the colorful neighborhood make it worth walking through. Visit the information center for maps and guides in several languages to all the attractions. If you’re feeling rundown from so much drinking, pop into the affordable Goku Tea Bar or classier Goku Chaso for some healing Chinese tea. The Yamate bluff area overlooks Motomachi, Chinatown and most of the rest of central Yokohama, providing breathtaking views of the city. On clear days, you can even see Mt. Fuji rising majestically in the distance. There are quite a few historical buildings open to the public. We like the scenic area for relaxing strolls. The Noge district is a charming crisscross of quaint streets and alleys packed with bars and small restaurants, some of them quite old. Despite its aged appearance, as if it were trapped in the 1960s and 70s, Noge today is quite an international area, with many new young owners and a wide array of cuisine. Noge’s establishments are typically cheap and open late—some until morning. Cross over to Yoshidamachi, the adjoining district, for even more evening entertainment!